*a song comes on* High dive into frozen waves where the past comes back to life…. I hear the song “Clarity” by Zedd come from my phone signaling that my alarm was going off. I opened my eyes to find that Devin was in the shower and getting ready to leave for the train station. We were scheduled to pick up our rental car in Hiroshima at 8 am, which meant that we had to be on the 6:03 am train to make it there by 7:30. Despite having only two and a half hours of sleep, I was surprisingly awake and alert. Energized by a good night’s sleep in a warm room and a comfortable bed, we set about getting ready and by 5:15 am we were on the road. The first order of business: breakfast. Have I told you how much I love Japanese food? I LOVE JAPANESE FOOD!!!! 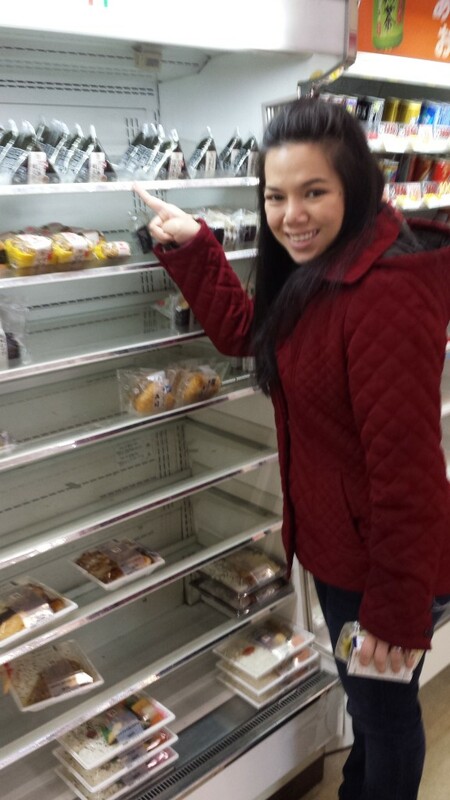 One of my favorite things about Japan (apart from Koi, of course) is the amazing convenience stores. This place has nearly everything you might need and the selection of food they have to offer is something that they really take seriously. Now I’m not talking about just sandwiches and instant ramen, which of course they also have to offer, but I’m talking about real food. Pork Cutlet over rice, with a side of salad and choice vegetables, Gyudon, fresh sushi and/or sashimi, my favorite onigiri (rice balls formed in a triangle with various kinds of stuffing wrapped in a large piece of nori), bakery-style bread buns in all different and delicious flavors from savory to sweet, fruits, pickled vegetables-they even have raw meat that you can take home and cook over a hot pot! As a people who pretty much invented the idea of the convenience store, they truly know how to impress and have taken the experience to a different level altogether. Folks, if you’ve never been into a genuine Japanese convenience store, you have not lived. We got a selection of rice balls, fruits, pickled vegetables and sandwiches for breakfast and set out to find a taxi that would take us to the station. As you can imagine, five in the morning isn’t the best time to find a taxi cab especially when there was a light drizzle going on. Devin and I stationed ourselves on adjacent street corners to better our chances of finding a cab sooner rather than later. About ten minutes into our search, a middle aged man came around the corner, apparently taking his little poodle out for a walk that morning. “Takushi? (Taxi? )” He asked us as he approached. “Hai.” we replied to him. He continued to walk towards the corner opposite from us and to our surprise began helping us wave a taxi down! Maybe as gaijin, we were doing something wrong in hailing a taxi down because as soon as he started helping us we had a cab in two minutes! This is the nature of the Japanese people. For the most part, they are always eager to help people out, especially foreigners who are trying to get around. This is a trait that I have experienced multiple times here, and I can honestly say there is probably no other country in the world where I would feel safer than in Japan. In other parts of Asia , help such as this more often than not expect a tip in return for their kindness and service, but not so in Japan. In fact, if you do decide to tip them, they take offense for your offering to pay for doing something that they feel was only their duty or because they were feeling helpful. We got to the station with 15 minutes to spare and settled into our Shinkansen seats to enjoy our breakfast. The train system in Japan is truly an amazing thing and on my first time here, I remember my dad telling me something about the trains: If the train isn’t on time, that means that you’ve got the wrong time. The trains are always on time, and exactly to the minute. No exaggeration. On the occasion, however, that there are some technical issues with the train and they have to delay the scheduled trips, the station will actually issue you a ‘hall pass’ of sorts to give to your boss to let them know that they have a valid reason for being late. Being late because there was a train delay rarely happens and the excuse is as valid as a natural disaster that couldn’t have been avoided. We arrive at Hiroshima and proceed to pick up our rental car. 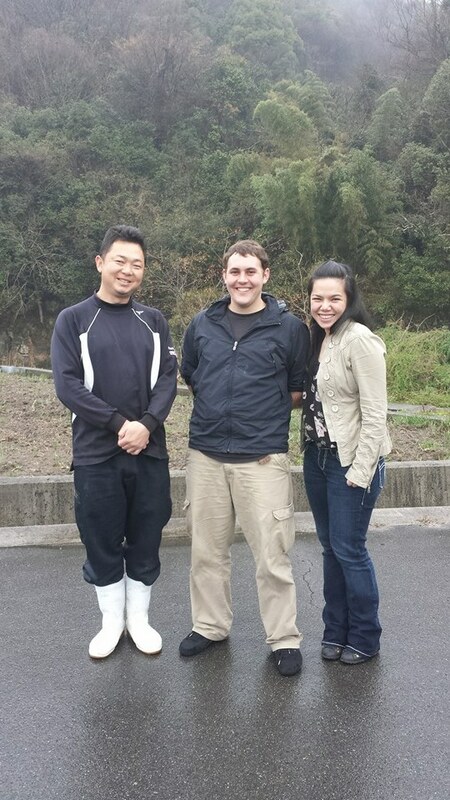 Taniguchi was the first stop on our list, and Devin had made an appointment to see him at 10 am. His place was only an hour away from our rental car pick up place and since we got there without incident (i.e. it was Devin’s first time to get there without getting lost!) and we arrived an hour earlier than expected. he produces are of superb quality, which is what has drawn Devin to return again this year for his search for Jumbo Tosai. 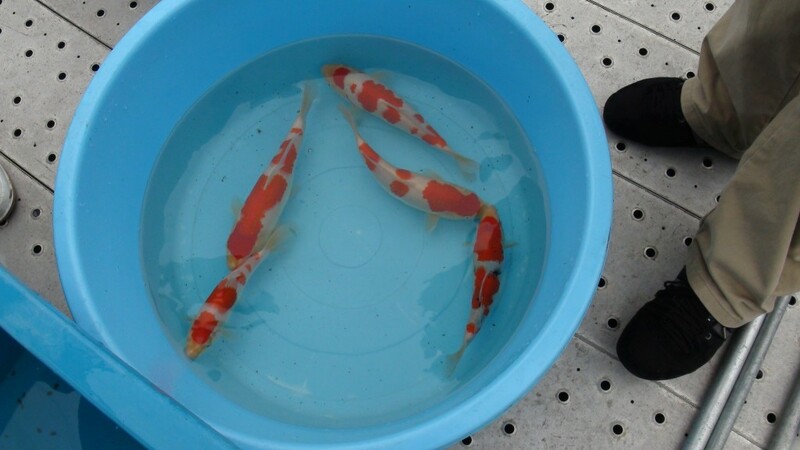 Taniguchi Koi has won a number of awards in various Koi shows all over Japan, most notable of which was Grand Champion at the Hiroshoma Young Koi Show. 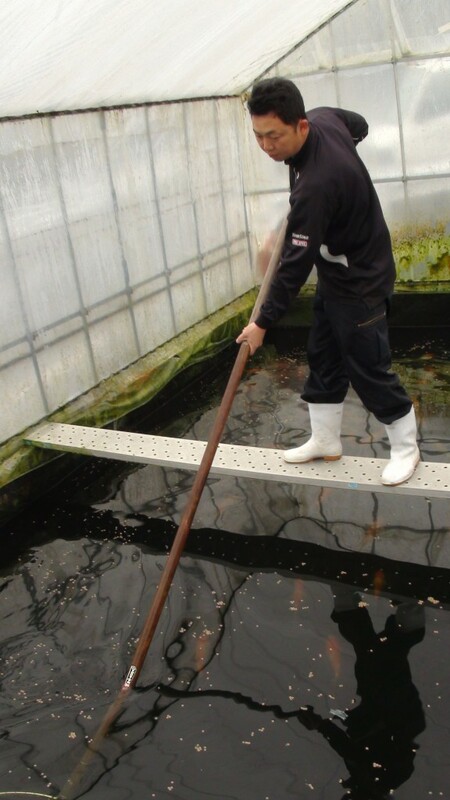 Sacho (Sacho means “president” and typically refers to the big boss of a company, or in this case, Koi farm) worked at Oishi koi farm for several years prior to establishing his own farm and since then he has been quite passionate about producing high quality Koi with special focus on gosanke. Sacho wasn’t around when we got there, but his staff welcomed us to view the Koi and showed us which tanks we were going to pick out from. We looked through the Koi and after a while, decided to get into some trouble…. There were several greenhouses at Taniguchi’s place and since the doors were open to a number of them, we showed ourselves inside (hehe).The last time Devin was here there were a few tanks that Sacho showed him which left quite the impression and he was eager to share it with me. 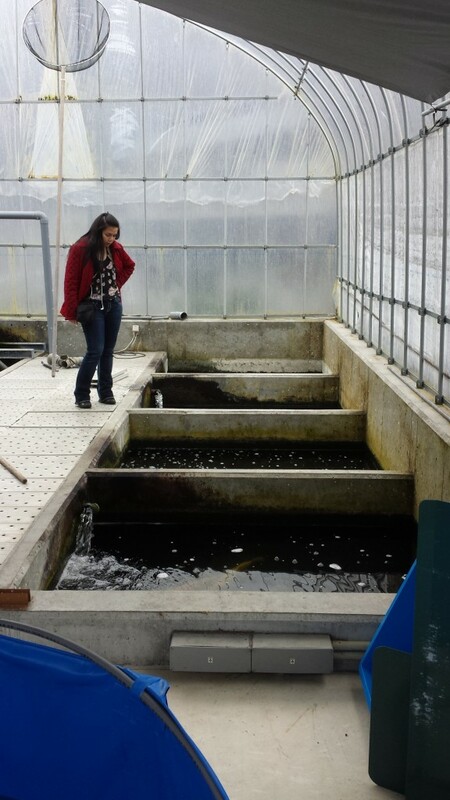 The farm is set up with several small greenhouses nearby each other, each with it’s own purpose and/or levels and classes of Koi. One such greenhouse that he had was dedicated to conditioning Koi for showing. We walk into that greenhouse and I’m greeted by one large tank on the right-hand side showcasing two large bakki showers. I peeked into the tank and saw several beautiful large fish ranging from around 50-80 cm. While I was admiring his Koi, Devin called me over to the opposite side of the building. “Mik, over here. Check this out” Devin said. I walk over to where he was and saw that Taniguchi managed to cramp in 6 tanks in the same amount of space as the large tank I had just came from. 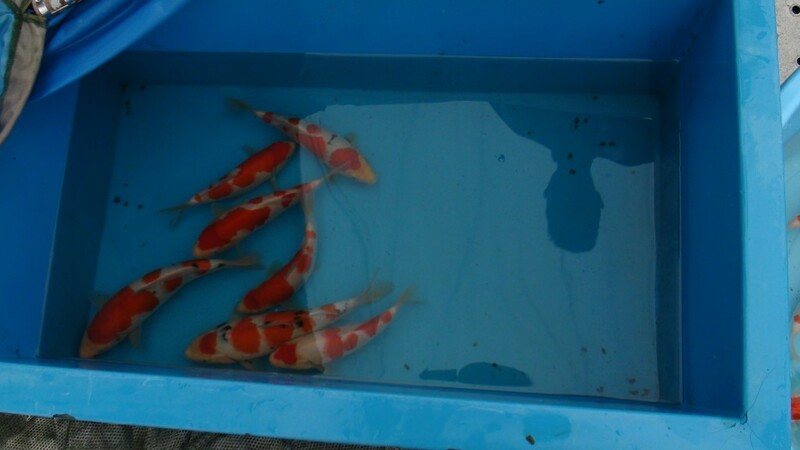 On one side, he had 2 tanks that was roughly a quarter size of the large tank and opposite from that, he had four very small tanks similar to what you would find at Koi shops that display tosai Koi. What I found when I looked into those smaller tanks was quite astonishing. Cramped into the small space was anywhere between 10-15 Koi that were about 40-60 cm in size of different varieties. Each one of them had large bodies and beautiful skin. “These are the tanks where he conditions his Koi that he wants to win at smaller size classes.” Devin explained. This was something quite astonishing. You see, when selecting Koi that you are either buying or bringing to a show, it isn’t enough that you pick good Koi. Ideally it would start at deciding which show you want to win at then aiming for a specific award as a goal and then choosing the Koi that you are bringing to the show with based on those distinct purposes in mind. For the most part, this method is mostly reserved for the most dilligent, dedicated and dangerously competitive hobbyists. 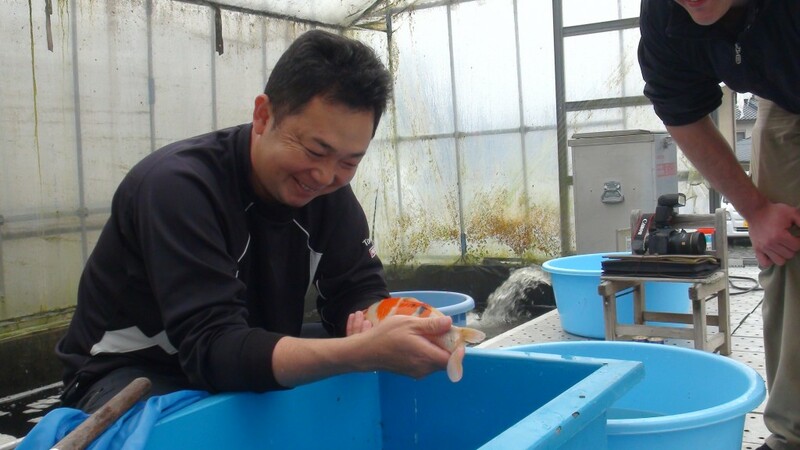 Taniguchi, however, takes this method a step further: he selects the Koi from a much younger age and rears them over a long period of time until he feels they are ready to fulfill his goal. Whether it takes 3 months or 3 years of conditioning, he patiently waits for the Koi to reach it’s potential while purposely keeping it at the size he needs it to be. We walk around some of the other buildings, some of which Devin hadn’t been in before (hehe.. sneaky sneaky…! ), making an effort to get into as much trouble as we could without actually causing trouble (or leaving evidence!). Sacho arrives at around half past ten and after some tea in his home, we proceed to pick out Koi. It took nearly no time to pick out Koi, since we already had a good idea which ones we were interested in netting anyway. Devin selected a total of 14 Jumbo tosai and then came my *cough* least *cough* favorite part of buying Koi: photo documentation. Many a “koi couple” understand what I’m talking about when I say that it is during Koi documentation that your relationship is truly put to the test. It is the most tedious and stagnant of tasks-one which I consider to be a necessary evil. Thankfully, Devin and I are as patient as humanly possible to be with one another in fulfilling this task. Time definitely goes by in slow motion, and an hour and a half later we finish photographing and video-documenting all the Koi. 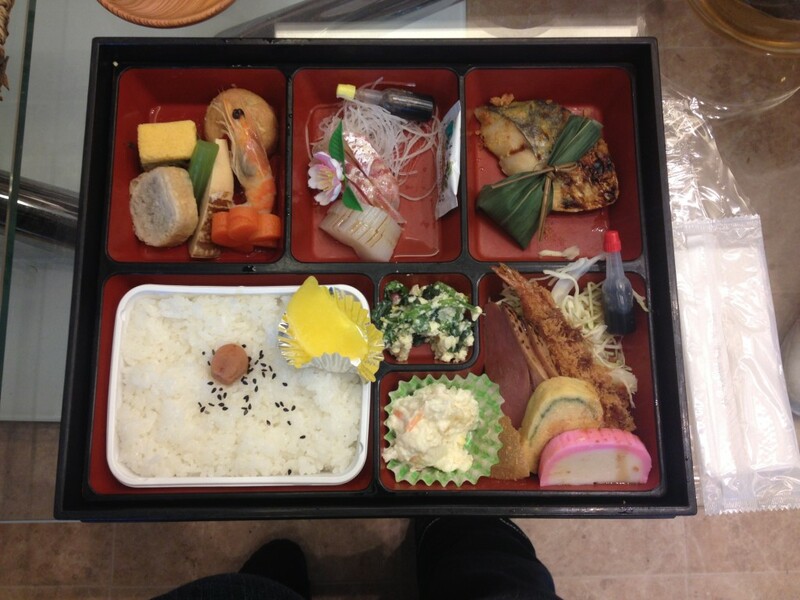 Sacho invited us into his home for a bento lunch, which they have delivered to their home. Now take-out food in Japan is amazing: it’s like you had the restaurant server hand-deliver the food to your doorstep. Everything is perfectly placed and it looks so beautiful that half the time you have to ask if it’s just a decorative piece or if it’s something that is actually part of the meal. After lunch, Devin completes his transaction with Sacho and we get ready to leave. Before departing, Sacho asks if we would like to see his new greenhouses. What?! We missed something?! Of course we would like to see it! We get into the car and drive a little bit down to road to find four smaller greenhouses side by side, with anywhere from 2 – 6 ponds each. Since it was so new, some ponds only had test fish in them, save for one. This pond had two very large and beautiful Koi with massive bodies and a glittering sheen on its skin. “The pattern of these fishes are not very good, but the quality is excellent. These are my new parent fish that I just got from Sakai Fish Farm (in Hiroshima).” Sacho explained. He hadn’t yet used them to breed Koi since they were so new, but Devin and I can’t wait to see the Koi that these two very special oyagoi (parent stock) produces. 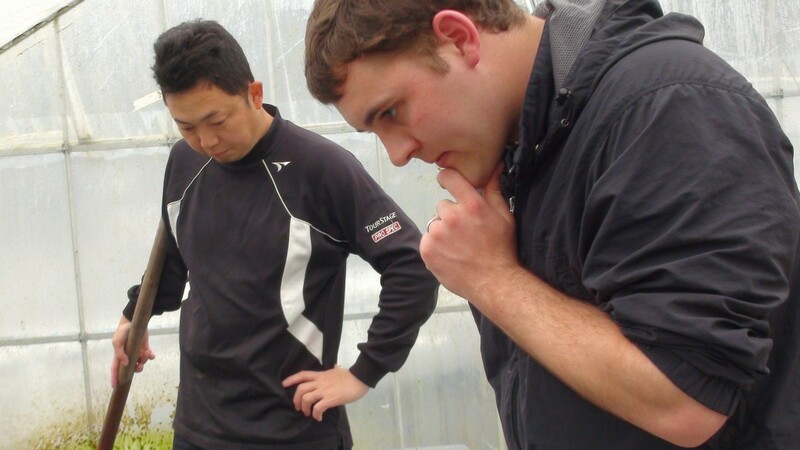 We thank them for their hospitality and head back on the road for our 2 hour drive to Omosako Koi Farm. It was quite rainy so we were worried that it would be too dark to buy Koi by the time we got there. After a few wrong turns and closed roads, we finally get on the right highway leading to Kure in anxious anticipation for more Koi! 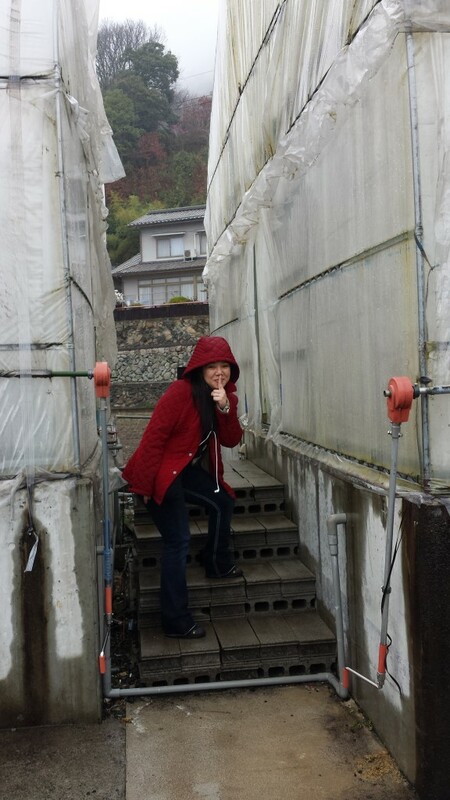 *Blog on Omosako Koi Farm coming soon! Looks like you and Devin are having a great time in Japan. I love reading your blogs.